"This is a victory for public pressure," said Mario Staderini, the leader of the Italian Radicals party. "We've managed to break down – a little bit – the wall protecting the Church." The Italian leader of the Radical party has been trying to change the exemption which came into effect 2005. The Tablet correspondence made the situation look worse than it is by pointing out difficulties in the Vatican. Sadly, there is a false idea that the Church is wealthy beyond belief. This is persecution, plain and simple. 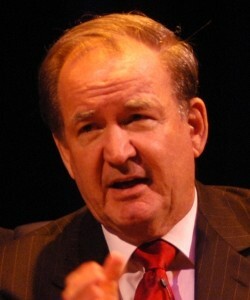 Pat Buchanan will no longer be a commentator on MSNBS. Here is the story. Directly from LifeSiteNews: double standard from Government regarding Occupy Washington and Priests for Life--Is anyone surprised? Updated: Feb. 16, 2012 at 4:48 pm EST. The six were arrested on a charge of “disobeying a lawful order.” The priest explained that while it is legal to hold protests in front of the White House, protesters are not allowed to remain stationary, including if they kneel down and pray. When Does the Virtual Community Become the Real Community? I have been thinking of the need for blogging among Catholics. Pope Benedict XVI, when Cardinal Ratzinger, in 2001, reiterated an earlier comment about the future of the Church: he stated, "it will be reduced in its dimensions, it will be necessary to start again. However, from this test a Church would emerge that will have been strengthened by the process of simplification it experienced, by its renewed capacity to look within itself." The Church Militant would not in any way resemble Christendom, or the Church Triumphant. The isolation of Catholics causes many problems, especially sacramentally for the number of priests who cannot meet the needs of those in rural or isolated areas already. The blogging community has characteristics different than other groups already. Firstly, the people in the group are technically savvy to a certain degree, have time to blog and post, and want information. This narrows the community down to a small group among Catholics in general. Secondly, the people in the group have an unusually high level of reading comprehension, like to pursue the Teachings of the Church and want to grow as adults. The Catholic Faith has always been "intellectual", even in opposition to the Protestant denominations, which undermined the rational and emphasized experience, as the Pentecostals do today. This great heritage of the rational merged with the faith life is essentially Catholic. Thirdly, these communities are self-selecting and tend to be either conservative, or orthodox, or liberal or liturgical and so on. If one looks at the blog lists of many of the bloggers, one sees overlaps, which indicated a community of sorts. Lastly, the blogging community is temporary and immediate. That is, it responds to needs and events which are "now". Father Ray Blake's blog and Father Z's blog have responded in depth to areas needing action, political and financial, for example, in the past weeks especially. But, the temporariness of the blogging community needs to be addressed more seriously. If a lone blogger in Germany cannot find the community with which he or she can share Faith, except online, this is a possible area of real concern. Even me, in a semi-rural area of Ireland, rely on bloggers for my main source of Catholic conversation daily or weekly. The local church communities no longer exist as communities, and the anti-intellectualism of most Catholics leads to isolation. How long we can rely on the virtual communties is a key discussion, as real communities must function in close proximity. I was in a lay community for seven years, and the day-to-day life of a basic Christian community barely resembles the virtual. However virtual communities exist now, this will change and we shall have to adjust in ways which may demand moving or being completely isolated.